This children’s book is a community service project conceived and written by my wife Paula and illustrated by my then-12-year-old step-daughter Laura. I contributed a small amount to the story and wrote the afterword. Profits from all sales of this title are donated directly to Snooty Giggles Dog Rescue in Thompson’s Station, Tenn. You can buy your copy at Two Peas Publishing, Amazon.com, or BarnesandNoble.com. When puppy Walter is adopted and separated from his littermates, he is both nervous and excited about his new life and the adventures on which he is about to embark. But when his new human family discovers that living with a dog requires as much work as it does love and fun, Walter finds himself banished to their backyard, where he is chained to a stake: all day, all night, and in all weather. Soon Walter’s family abandons him completely, and he is thrown into the street. Hurt, hungry, and alone, Walter is quickly discovered by a new family. They work feverishly through long days and nights to help him recover from the neglect he suffered at the hands of his old family. Can Walter’s newfound friends restore his strength and his faith in humanity? Based on the true events surrounding the discovery of an abandoned Cocker Spaniel/Poodle mix on the streets in the White’s Creek area of Nashville, Tennessee, My Name Is Walter is a cautionary tale about responsibility and pet ownership. In real life, Walter’s story captured the imagination of many and seemed to unite the world against the horror of animal cruelty. This book is intended to honor Walter and all abused and neglected pets with its message of responsible pet ownership. When puppy Walter is adopted and separated from his littermates, he is both nervous and excited about his new life and the adventures on which he is about to embark. But when his new human family discovers that living with a dog requires as much work as it does love and fun, Walter finds himself banished to their backyard, where he is chained to a stake: all day, all night, and in all weather. Soon Walter's family abandons him completely, and he is thrown into the street. Hurt, hungry, and alone, Walter is quickly discovered by a new family. They work feverishly through long days and nights to help him recover from the neglect he suffered at the hands of his old family. Can Walter's newfound friends restore his strength and his faith in humanity? Based on the true events surrounding the discovery of an abandoned Cocker Spaniel/Poodle mix on the streets in the White's Creek area of Nashville, Tennessee, MY NAME IS WALTER is a cautionary tale about responsibility and pet ownership. In real life, Walter's story captured the imagination of many and seemed to unite the world against the horror of animal cruelty. 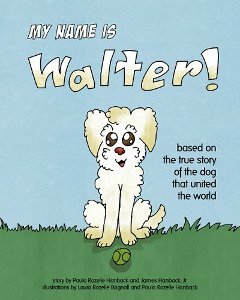 This book is intended to honor Walter and all abused and neglected pets with its message of responsible pet ownership. 100% of the Publisher's and Author's profits from the sale of this book go to Snooty Giggles Dog Rescue, the organization that helped Walter. You can help ensure the future of plugins such as ScrapeAZon, GoodReviews, and Book Previewer with your donations. You can also donate by purchasing any ebook by this publisher. James Hanback Jr is an IT professional, technical writer, and the author of the science fiction novelette TIMECAST. He also enjoys the beach.